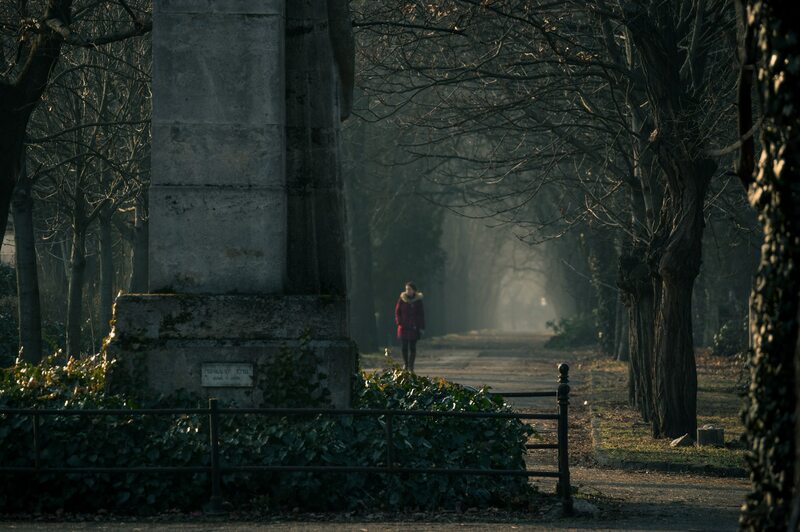 Cemeteries more often than not, tend to cast a shadow on people’s minds. That’s because no other construction is so emotionally attached to humans and the bitter pill that they have to swallow from the first day they come into this world—death. 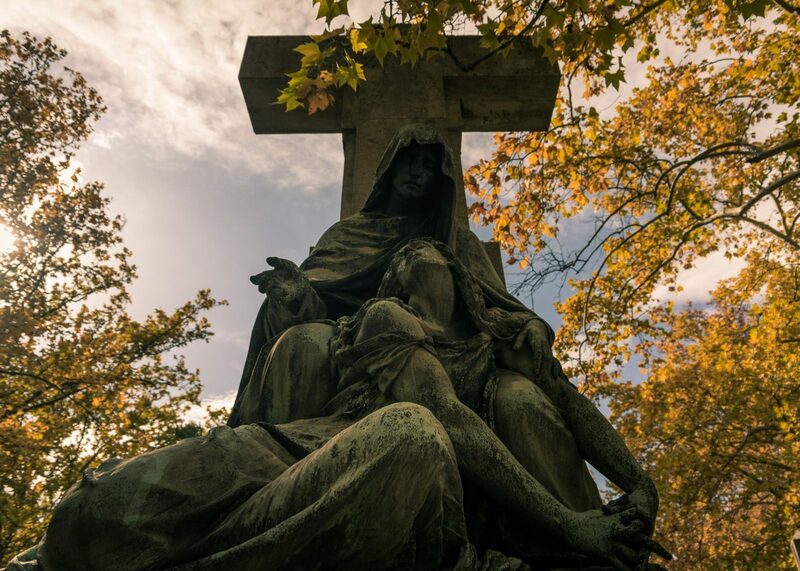 So, how can something that reflects our mortality be so calm and beautiful at the same time? Kerepesi or Fiume Road National Graveyard as its official name is, was constructed in the middle of 19th century along with other park-cemeteries all over Europe. 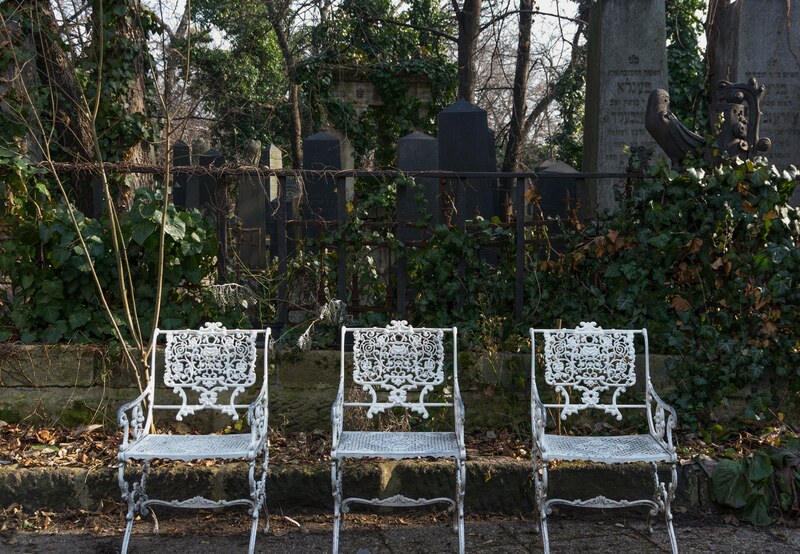 Churchyards—the most common burial grounds till then, were getting short on space. 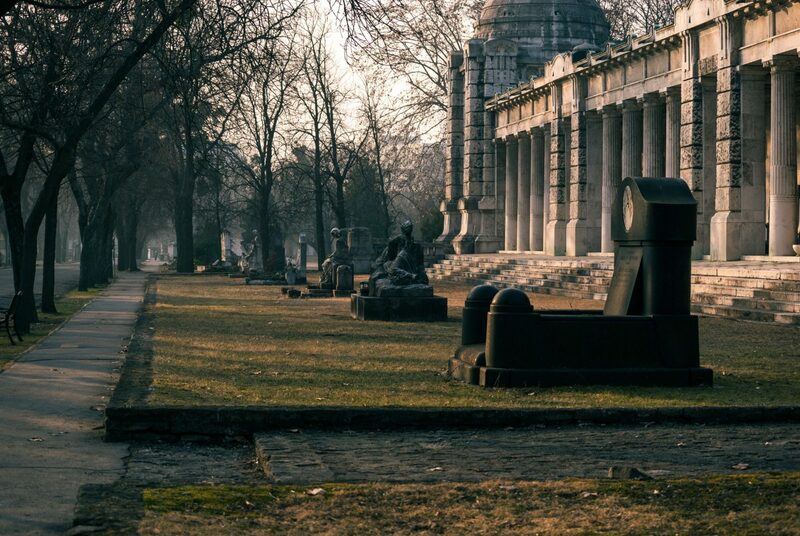 Consequently, many European cities started building bigger, park-like necropolises outside their boundaries. 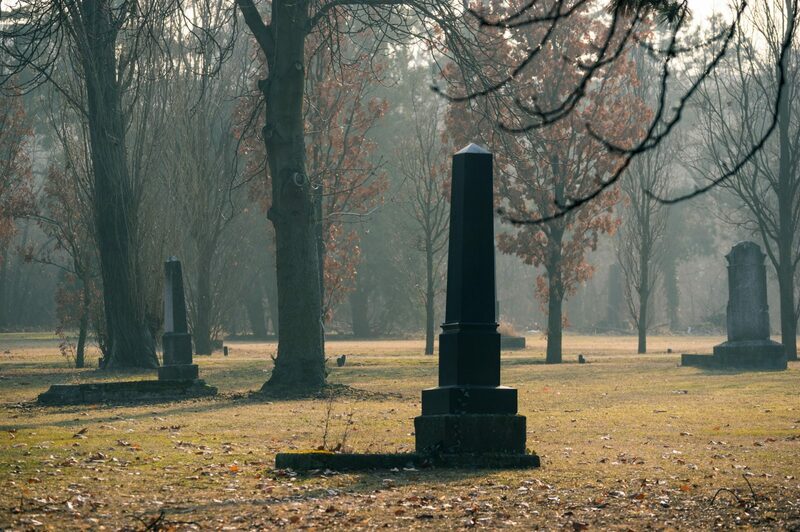 Those places were designed to be something more than a burial ground. People could go there and enjoy a stroll while admiring the art used to decorate the tombs. And admiring art was a luxury for the non-wealthy back then. 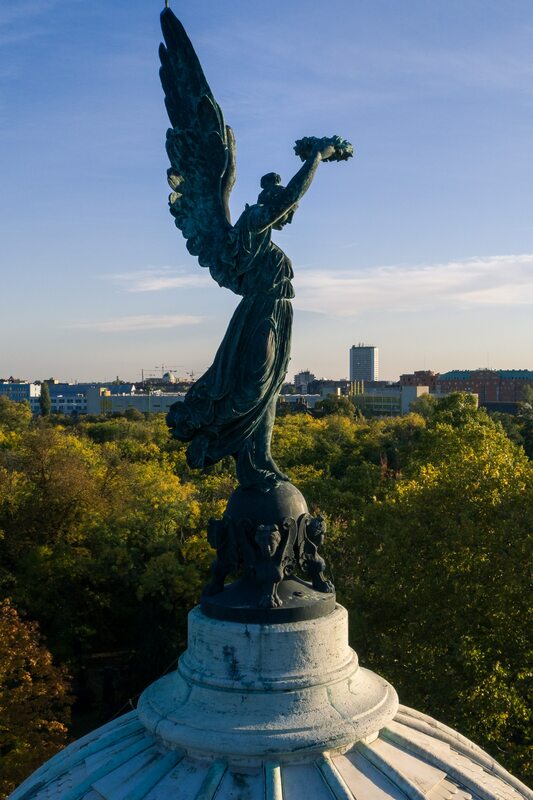 Although Kerepesi is only a couple of blocks away from Keleti—Budapest’s central train station, it is relative unknown to the majority of people visiting the Hungarian capital. Naturally it’s not a classic sight like the Parliament or the Basilica of St. Stephen but nevertheless it’s much more than just a beautiful park. To be honest even I wouldn’t know about it if Warren Richardson hadn’t told me one freezing morning. 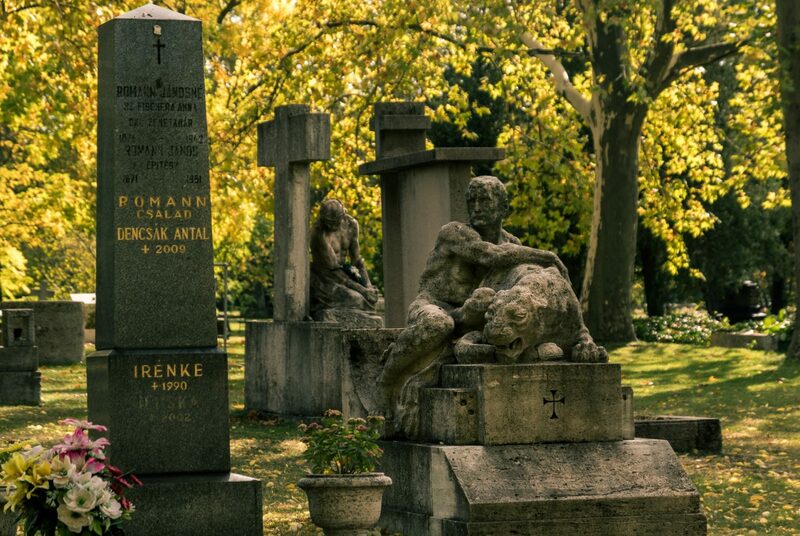 Warren is an internationally acclaimed photographer from Australia who now lives in Budapest and Kerepesi is one of his favorite spots. 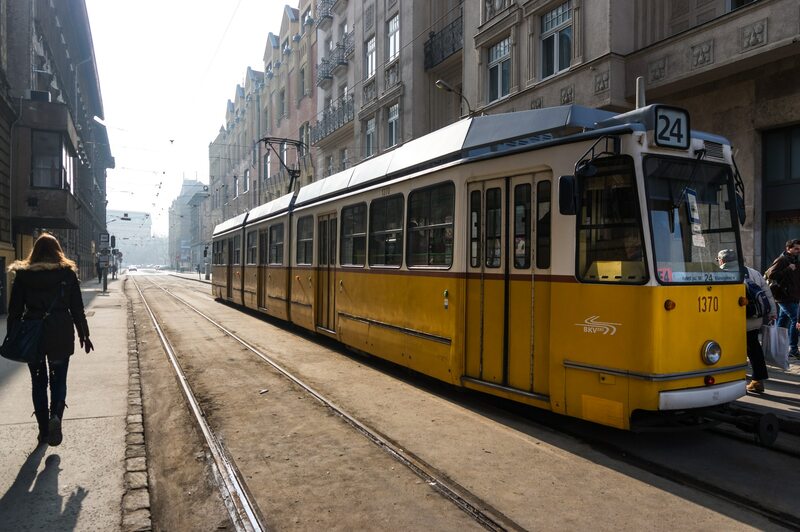 Coming from downtown, I turned right just before Keleti train station on Festetics György—a small street used as the terminal station for tram 24. The road there is abruptly blocked by a pavement just before reaching the noisy avenue thus forming a dead end for cars, something that makes it strangely quiet. This desolation is broken periodically by the people getting on and off the old yellow trams. “Keep going till you see the old brick wall and walk along. You can’t miss it.” Warren had instructed me and indeed the old shabby wall of the magnificent building that houses the police museum was there to lead me to the cemetery just around the corner. The black iron gate was entirely open when I got there. As I was passing, the guards gave me a brief look and I answered with a nod. The roads left and right were going along the perimeter so, I decided to follow the one ahead of me which was disappearing in the heart of the seemingly vast park. How could this exist in the heart of Budapest and be relative unknown? It didn’t take me long to reach the two Italian style arcades—one on each side of the road. Their statues were graceful. The white of their stone and the light green patina of the bronze dominated the structures. Secondary roads, were leading to several clearings. 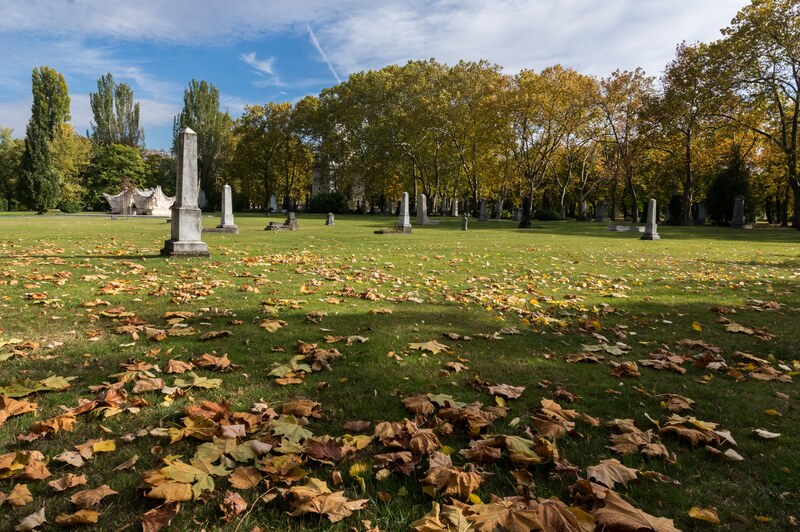 Some of them occupied by graves and others relative empty or with a mausoleum in the middle. Occasionally a small garden broke the monotony of the green grass. I was going from one clearing to the next exploring the park and admiring the art and flora on the way. Some graves were exquisite pieces of art. The statues that decorated them could have been an exhibit in any museum in the world. 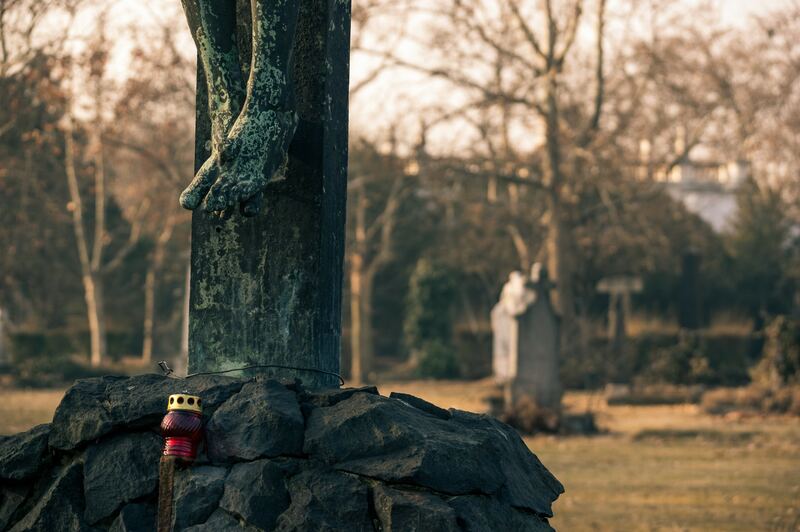 Most were man sized figures—some peaceful and tranquil, others depicting tragic scenes with angels comforting the deceased or showing them the way to the other side. There was a musician playing her violin and a shepherd with his sheep, a man sitting next to a tiger and a caped dark figure standing guard—leaning on his sword above a dead man. Another statue was dancing in a manner that made it look like it was levitating above the tomb. Some were distant from everything and others surrounded by dense forest and all sorts of vegetation which in some cases was climbing on the stones. After taking the first shots I was awestruck by how some of them resembled Gustav Dore’s dark illustrations and wood engravings, especially the ones he had made for Divine Comedy and Paradise Lost. The tall trees that cast long shadows and allowed only a few rays of light to pass through, reinforced that impression. 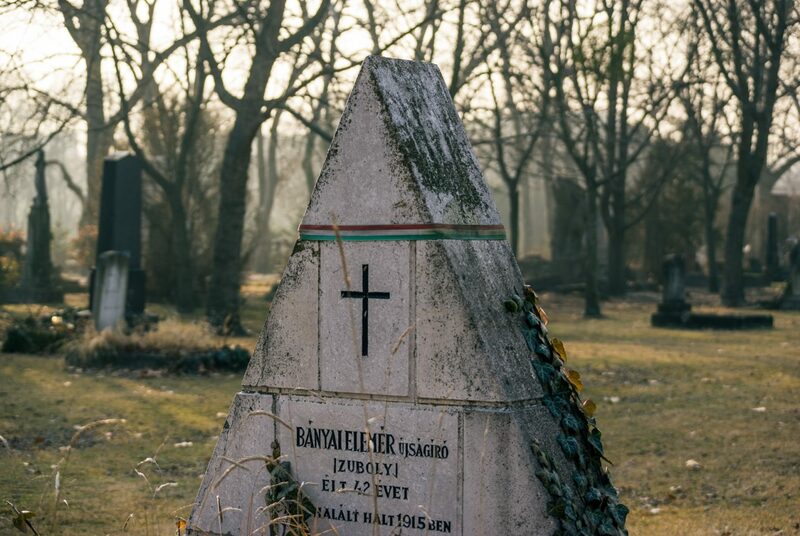 Except the tombs, Kerepesi has also great mausoleums. 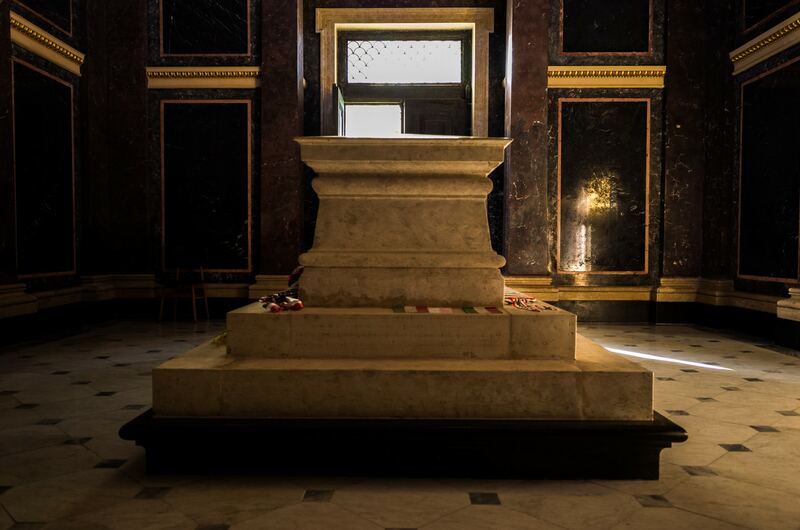 The one devoted to the Labor Movement and the three very eloquent serving as the resting place of Hungary’s most prominent statesmen being the most impressive. Lajos Batthyany—the first Prime minister of the country who was executed during the 1849 revolution. Ferenc Deak—who was Batthyany’s minister of Justice also known as “The wise man of the nation. 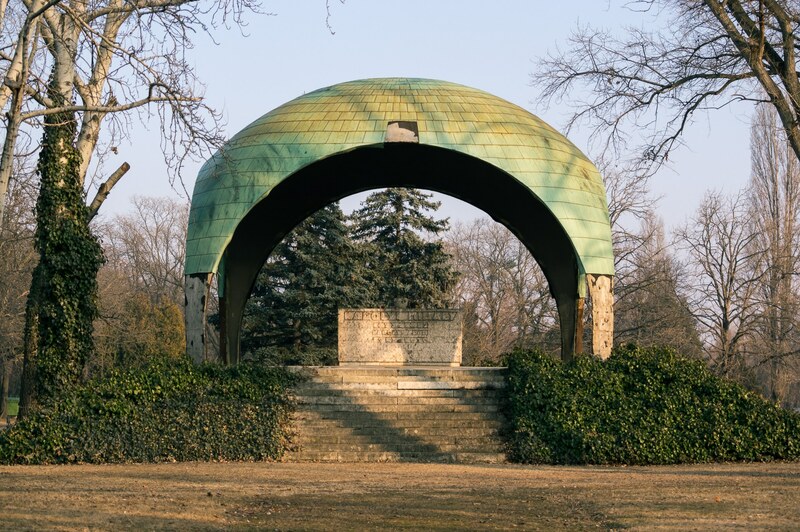 Lajos Kossuth—who is buried in the most impressive of all with a beautiful tree-lined road leading to it. He was the minister of Finance in the Batthyany government and the one who stepped in after his resignation. He fought for the freedom of the press and speech but on the same time he was a firm believer of Magyarization. Leo Szilard—the famous physicist who conceived the nuclear chain reaction and wrote (Einstein had cosigned it) the letter to Roosevelt about the need of an atomic program which initiated the Manhattan Project. Adam Clark—the Scotch engineer who built the iconic Chain bridge and Imre Steindl who architected the awe-inspiring parliament. Karl Maria Kertbeny—journalist, travel writer and human rights advocate. He fought for the decriminalization of sexuality and he coined the words heterosexual and homosexual, using the latter to replace adjectives like “sodomite” and “pederast” which were frequently used by then. Ignaz Semmelweis—a Physician and pioneer of antiseptic procedures, he discovered that if doctors washed their hands with a chlorinated solution before each examination, the mortality rate caused by puerperal fever on women who gave birth, dropped significantly. The fact that his finds were empirical though, lead the medical world to discredit him. Despite that he was fired from his hospital and ridiculed by the community, he fought back strenuously but eventually was admitted in an asylum where he died after getting beaten by the guards. Another most heart breaking story is that of Erika Szeles who fought during the revolution of 1956 against the Soviet Union. The fifteen year old girl, became famous from a photo taken by Vagn Hansen that became a cover for Billed Bladet magazine in Denmark. In that iconic photo, the young rebel is holding a submachine gun and her blazing gaze is pointed straight into Hansen’s lens. Decades later it was discovered that Erika was already dead when the magazine had hit the newsstands. It seems that when the Russian noose grew tighter around Budapest, she refused to leave and decided to put her weapon down and become a Red Cross volunteer in order to keep helping the wounded fighters. Her spotless life was cut short a few days later, from a Russian bullet. Her frugal grave is decorated with small flags which have a hole in the middle where the coat of arms was—a symbol of the revolution. 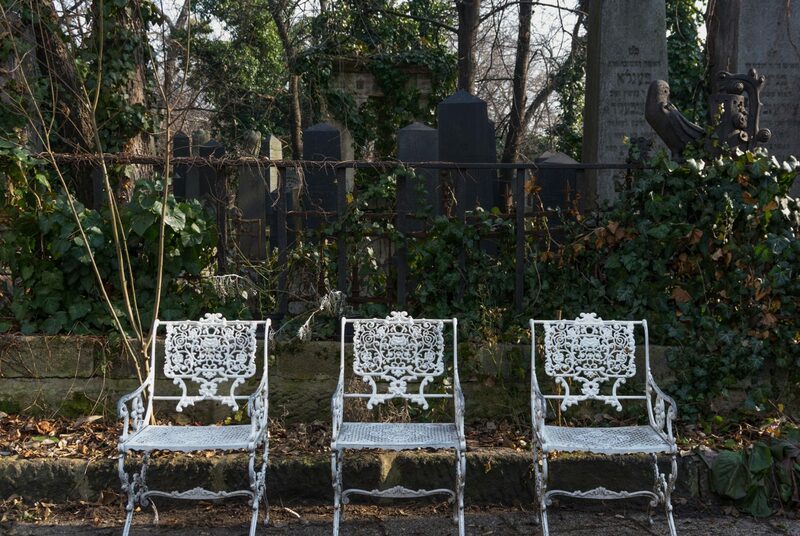 Attached to Kerepesi is another place of great significance—the Salgotarjani street Jewish cemetery. A wall separates the two graveyards so in order to visit it I had to get out and walk around the block to the Jewish cemetery’s entrance. Now, Fiumei utca is a rather busy street but the moment I turned to Salgotarjani it was like I was in a ghost town. Not a single soul was around as I was walking along the train tracks next to the familiar brick wall. Across the street was an abandoned building full of graffiti. With its broken windows and hills of rubble, It looked like a drug addict nest. When I got in front of the fort-like gate, I rung the bell and less than a minute later the guard opened the heavy door and allowed me in. His two dogs looked like they would eat me alive if they were not on a leash. The Jewish cemetery was totally different. Cramped, with narrow corridors, graves with heavy slabs and obelisk tombstones made of dark stone which had developed a green tint in the course of years. Everything was strict with almost no decorations. It was beautiful but in a darker gothic way. 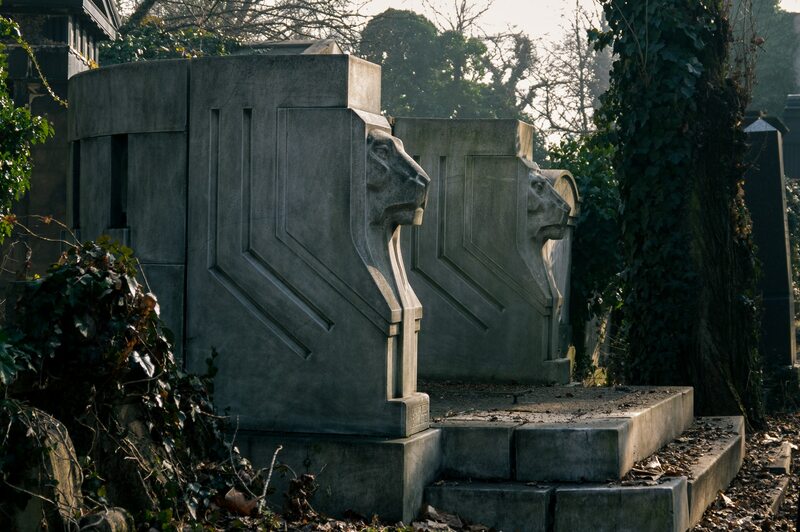 Some of the family vaults were truly epic looking more like movie sceneries than actual graves. It was evident that it had been abandoned for a long time. Decay and nature had taken over the premises, expanding on everything man made inside the graveyard. Some tombs had been violated and the burial chamber was visible from outside. Same went for some of the mausoleums’ many of which had broken doors. It felt much older than Kerepesi even though it’s not. In any way, it added to its dark atmosphere. I was informed that it is a strong candidate to become a UNESCO site too. If that actually happens, it would be great. The sun was finally setting. The hours had passed like minutes and as I was leaving, I took some of the serenity with me. I hadn’t had a more satisfying day for a long time and this one was probably the best I ever spent in Budapest. To answer my own question a cemetery can be a beautiful place even though it reminds us that we won’t be around forever. Perhaps, that is the seconds more important purpose a cemetery serves. and to Angelika Bálint for providing her valuable knowledge. 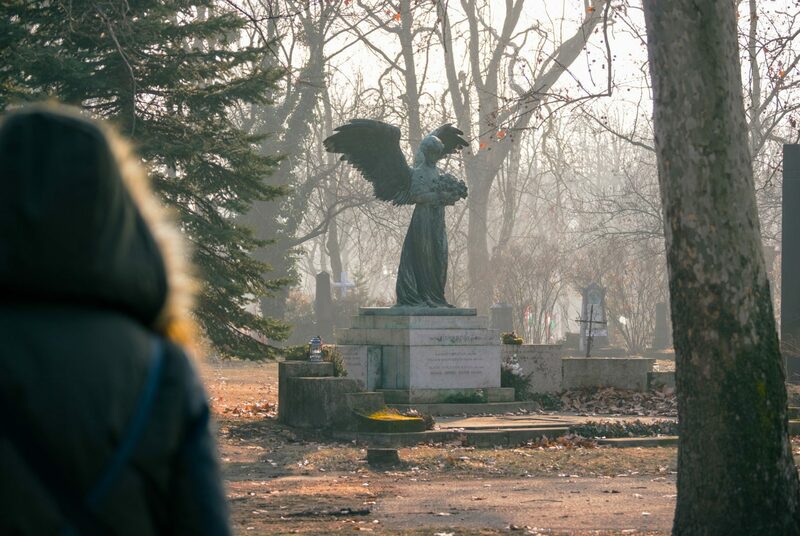 Cemeteries produce really atmospheric photos. I know of many tourists, who would never go to such place, but I am not the one. 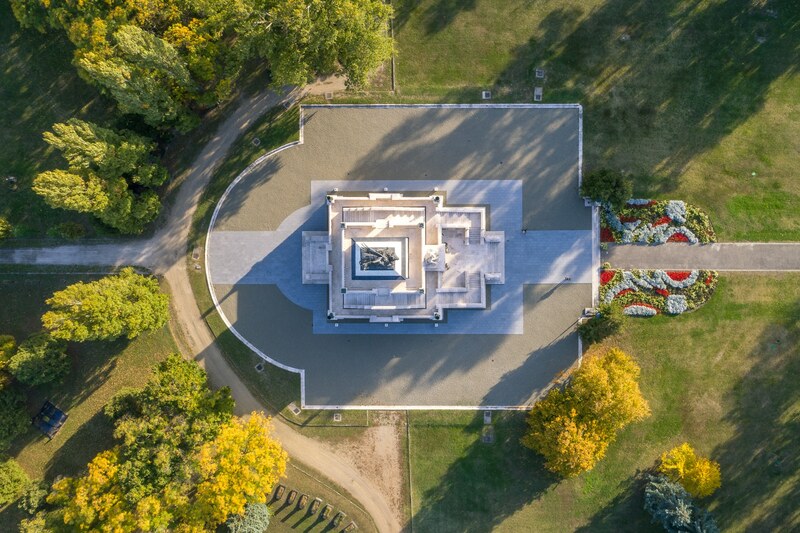 Lajos Kossuth Mausoleum, was it shot with a drone? I am about to get a first drone for myself. Yes it is with a Phantom 4 Pro as is the featured image. You won’t regret it. It will give you infinite possibilities. 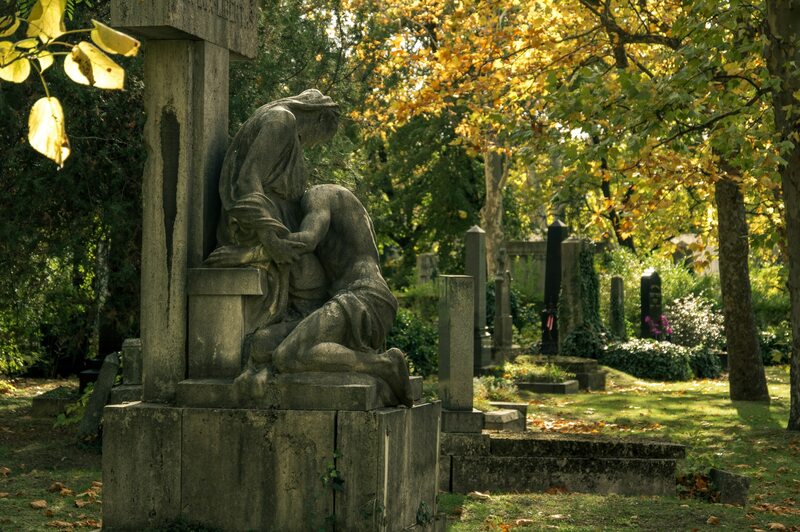 I’d definitely agree that cemeteries are eerily beautiful. It holds such a powerful meaning to everyone mainly because it makes life and death very close together. 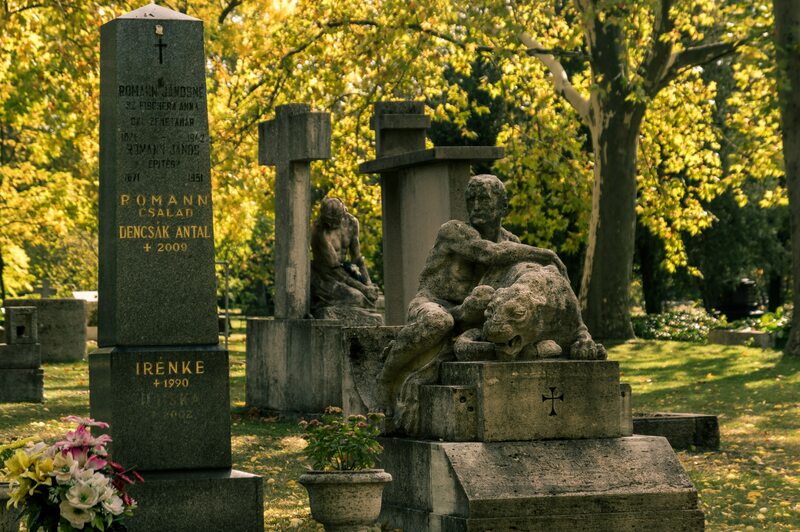 The Kerepesi Cemetery does look very serene. You have indeed spent a hauntingly beautiful day! I had never heard of Kerepesi cemetery before reading your post. 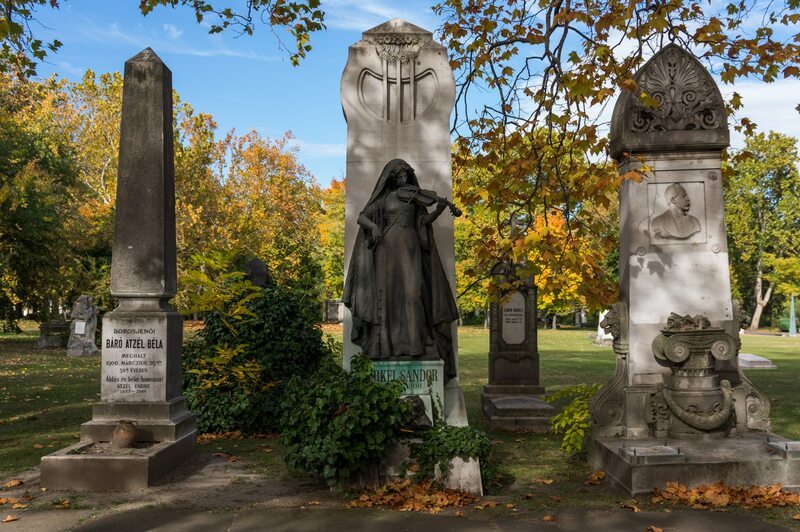 I agree with you that cemeteries possibly need more attention as landmarks of cities and towns. The photos have, for lack of a better word, an eerily magnificent quality about them. Thank you, it is true that some cemeteries are marvels of urban design and remain appealing even after almost two centuries. I do “enjoy” going to cemeteries myself. There is a lot of history that can be found there. 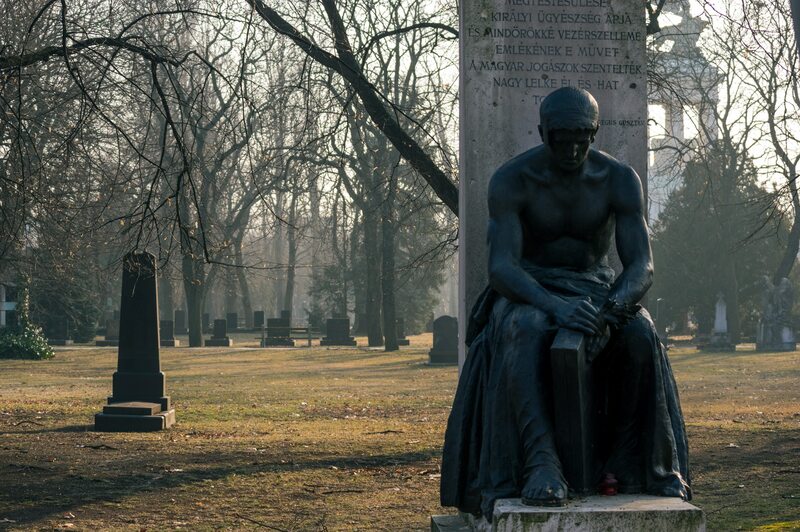 There is a cemetery in Birmingham, AL that does tours and they also host Sci FI movies there. I think it’s a way to help them keep people coming back and to help upkeep it. I know when I lived in Louisiana people actually have photo shoots at the cemeteries because the graves are not underground. They are different. It’s pretty cool though. I am not sure I would do a photo shoot there though. Kerepesi was built partly as a park so it’s natural for people to go there just to spend some time. Also I believe that cemeteries shouldn’t be scary places used only to bury a loved one. We westerners have a major issue with death and these kind of places can help a lot I think.